Founded: by Joan and David Helpern in Cambridge, Massachusetts, 1967. Company History: Joan & David label introduced, 1977; David & Joan menswear division launched, 1982; Joan & David Too, lower priced line of shoes and accessories introduced, 1987; first women's apparel collection produced by Sir for Her, 1983-85; second women's ready-to-wear collection produced by Gruppo GFT, from 1988; licensing agreement with Ann Taylor chain of fashion shops, 1967-92; producer and distributor, Calvin Klein Footwear, from 1990, and Calvin Klein accessories, 1990-91; New York flagship shop opened, 1985; in-store boutiques opened at Harvey Nichols, London, and Ogilvey's, Montreal, 1987; freestanding Paris and Hong Kong boutiques opened, 1988; filed for Chapter 11 and sold Joan Helpern Designs, Inc. to Maxwell Shoe Company, 2000. Awards: American Fashion Critics Coty award, 1978; Footwear News Designer of the Year award, 1986; Cutty Sark award, 1986; Golden Slipper award, 1988; Golden Shoe award, 1989; Fashion Footwear Association of New York award, 1990; Silver Trophy, 1992; Michelangelo award, 1993; Joan: Girl Scouts of America Woman of the Year, 1995. Member: Joan: Council of Fashion Designers of America; Committee of 200. Company Address: 4 West 58th Street, New York, NY 10019, USA. Joan Helpern in a Joan & David showroom, 1999. Trasko, Mary, Heavenly Soles, New York, 1989. Bethany, Marilyn, "Sole Sister," in New York, 10 March 1986. "Joan and David: Less is More," in Vogue (Paris), October 1986. Infantino, Vivian, "Designer of the Year: Joan Helpern," in Footwear News, December 1986. Williams, Lisa, "Uniquely Joan & David," in Footwear News, March 1989. Huffman, Frances, "Role Model," in Entrepreneurial Woman (Irvine, California), March 1992. Furman, Phyllis, "Putting New Foot Forward: Joan and David Rebuilds After Ann Taylor Rift," in Crain's New York Business, 23 March 1992. Quinn, Colleen, "The Many Dimensions of Joan Helpern," in Footwear News, 1 June 1992. Infantino, Vivian, "World Class Performances: Joan & David—It Ain't Just Shoes," in Footwear News, November 1992. Moin, David, "Joan's New Platforms: Not Just Shoes," in WWD, 23August 1993. Barnett, Amy DuBois, "The Interview: Joan & David Matriarch," in Fashion Planet, Spring 1997. Joan & David, Inc. is responsible for making flat shoes for women fashionable. The company developed because Joan Helpern wanted a comfortable, stylish shoe that would not become dated through its design. When Joan married David Helpern in the 1960s, she was a student in child psychology working on her Ph.D. at Harvard University. In her multiple roles of wife, mother, teacher, and student, Joan wanted a shoe that was not a gym shoe, loafer, or stiletto, the only readily available styles for women at the time. She needed a shoe that would look stylish yet allow her to get about the city in comfort. The solution was to design the shoe herself, an oxford style still available in a modified form today. 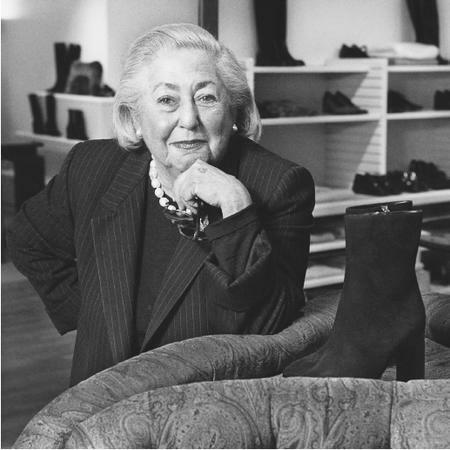 While editing academic manuscripts, Joan created footwear designs for department stores and private labels, including Harvard Square and Foreign Affairs. She began designing under the name of Joan & David in 1977. Joan served as president and designer, while David was chairman of the company. Joan & David designs are found throughout the world. The shoes are manufactured in Italy, because it was there that Joan found craftspeople willing to produce limited editions of her designs, numbering from 12 to 120, to her specifications. Joan & David, Inc. produces shoes specifically for women under the name Joan & David, Joan & David Too, and Joan & David Couture. Men's footwear is designed under the names David & Joan and David & Joan Couture. Through the years, the product line has expanded to include purses, belts, scarves, socks, sunglasses, and other accessories as well as women's ready-to-wear. Joan's entry into the design field was not planned, and she had no formal design training. She knew, however, what she wanted in a shoe, so she researched the market and technology involved in their manufacture. She was able to produce footwear to meet the needs of active women like herself, who race through the day serving in many different roles, who are not self-consciously fashionable but value good quality and style. Joan has a less-is-more philosophy when it comes to design; she concentrates on classic, usable styles such as oxfords and patent pumps with designs evolving from year to year. The colors she uses are subtle with the emphasis on interesting textures, and comfort is essential. Neither flat shoes nor shoes with low heels have extraneous details or extreme designs. In 1978 she was given the Coty award for her designs. Joan has been influential in the field of shoe design. By successfully creating both comfortable and stylish shoes, she helped open up a new way of thinking about shoe design for women. Professional women wanted what Joan herself originally searched for—a fashionably comfortable shoe that would not be an obsolete design the next season—something more stylish than sneakers but more comfortable than stilettos. By providing herself with such shoes, Joan, along with her husband David, were able to fill this need and develop the successful business named Joan & David. The Helperns have long been known for their philanthropy. "We try to support the major worldwide concerns like AIDS and breast and prostate cancer research," Joan told Amy DuBois Barnett of Fashion Planet. "But it's also a matter of where David and I feel most involved." In 1995, New York City's Columbia-Presbyterian Medical Center used a donation from the couple to open the Joan and David Helpern Clinical Noninvasive Vascular Diagnostic Laboratory. The Helperns have also been interested in vision care, providing glasses and medical treatment for needy children. At the turn of the century, the Helperns' shoe business took a turn for the worse. In March 2000 Joan & David filed for chapter 11 bankruptcy protection. Later that year, Joan Helpern Designs, Inc. was purchased by the Maxwell Shoe Company for $16.8 million. The sale included most of the company's assets, including its 7,000-square-foot New York office, as well as trademarks for all Helpern designs. Footwear giant Maxwell Shoe, in business since 1949, also owns brands including Mootsies Tootsies, Dockers Footwear for Women, Anne Klein 2, and Sam & Libby shoes. The company planned to relaunch the Joan & David line in 2001, bringing down their customary prices in a long-term effort to increase sales to $40 million or $50 million. Great article. Awesome shoes. My first pair still look brand new. Jean Patou John, John P.